Samsung Galaxy A30 Dual camera with fast charging feature. The Samsung Galaxy A30 smartphone launched in the Global Market. The Galaxy A30 looks modern and has 6.4-inch Super AMOLED screen with an Infinity-U notch for the selfie camera. Talking about Samsung’s Galaxy A-series, there is the entry-level Galaxy A10, the mid-range Galaxy A30, and then there’s the Galaxy A50. The Samsung Galaxy A30 is a less expensive version of the Galaxy A50. The Samsung Galaxy A30 smartphone is available at Amazon India, flipkart and other retail outlets. The Galaxy A30 flaunts an Infinity-U waterdrop display, with a unique design that is spiced up with a classic color. It looks modern and has a vibrant 6.4-inch Super AMOLED screen with an Infinity-U notch for the selfie camera. This smartphone houses a 3.5mm audio jack and also offers a USB-Type C port, but lacks LED Notification feature. There’s only one configuration in India market, with 4GB RAM and 64GB storage area. 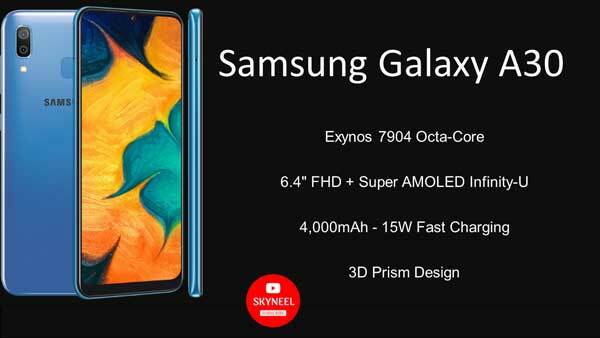 This smartphone comes with 4000mAh battery with fast charging feature and running on Android 9 Pie with the new OneUI skin. The Samsung Galaxy A30 mobile features a 6.4-inch Super AMOLED,(16.26 cm) display with a screen resolution of 1080 x 2340 pixels with a pixel density of 403ppi. The aspect ratio of this device is 19.5:9. The display looks excellent with vibrant contrasts and rich colors, and its punchy-ness makes every image really pop out. The viewing angles are great as well. The Galaxy A30 is powered by 14nm Samsung Exynos 7904 chipset, Octa core (1.8 GHz, Dual core, Cortex A73 + 1.6 GHz, Hexa Core, Cortex A53) processor paired with 4 GB of RAM. This smartphone is paired with Mali-G71 MP2 GPU, 4GB RAM and 64GB storage area. You can easily extended storage area up to 512GB via microSD card. The Galaxy A30 feels light weight, pretty large and much battery gripping to easily hold in single hand. At the back panel, there is a vertically-stacked dual camera setup, coupled with a flash. The Galaxy A30 offers only dual cameras while Galaxy A50 pack with three cameras at the back. The setup includes a 16-megapixel f/1.7 sensor and a 5-megapixel wide-angle camera sensor. The 5-megapixel rear ultra-wide sensor take above average images with moderate details and sharpness. The front camera, comes with 16-megapixel f/2.0 shooter, which captures decent selfies in natural light with true color tone, live focus feature. The Galaxy M30 is backed by a massive 5,000mAh battery, while the Galaxy A50 and the Galaxy A30 packs a 4,000mAh battery inside. You can easily power up your phone in a jiffy with 15W Fast Charging. The smartphone comes with 1080×2340 pixels resolution with a 6.4-inch Full HD + LCD display with 19.5:9 aspect ratio. If we talk about the connectivity feature this smartphone comes with Wi-Fi 802.11 a/b/g/n/ac, dual-band, WiFi Direct, hotspot, Bluetooth v5.0, GPS, GLONASS, FM Radio,USB 2.0, Type-C 1.0 reversible connector. Memory Available in – 4GB+64GB Storage capacity. Display 6.4-inch Full HD + LCD display, 1080 x 2310 pixels resolution with Mali-G71 MP2 GPU and 19.5:9 aspect ratio. Camera 16-megapixel f/1.7 sensor and a 5-megapixel wide-angle camera sensor, LED, Panorama, HDR and 16-megapixel (f/2.0) front camera for taking selfies. Connectivity Dual Nano SIM. Supports 3G, 4G, Wi-Fi, Bluetooth 5.0, GPS, FM Radio, USB 2.0, Type-C 1.0 reversible connector. Price & Color Priced: 4GB+64GB available at 16,990. Color: Black, Blue and Red. This is a mid-range budget nice smartphone which comes with Super AMOLED Infinity-U display, support fast charging, rear fingerprint sensor, 3D prism design. Overall this smartphone is very good under Rs. 17000. In this range you also have a better alternative of the Galaxy A30 would be Galaxy M30, which is available for Rs 14,990 for the 4GB/6GB RAM variants. Samsung Galaxy M30 offers a massive 5,000mAh battery, triple camera setup, same big display, and trendy design, but with an older Samsung Experience UI with Android Oreo.